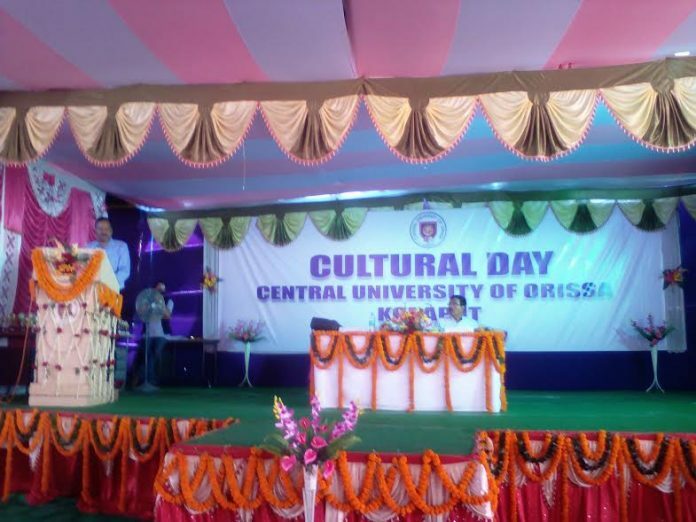 Report by Nishapati Nayak, Sunabeda: The Central University of Orissa organised a Cultural Day programme at its Sunabeda campus today. Hon’ble Vice-Chancellor Prof. Sachidananda Mohanty inaugurates the programme as the chief guest and Prof. Kishore Chandra Raut, Dean-Academics delivered the welcome address on this occasion. Prof. Mohanty in his address stressed on the development of the ability of the students for the excellence to get success. Students to make proper use of the resources and opportunity they are getting in life Prof. Mohanty advised. He motivated them to dedicate themselves for the quest of excellence in life. He said “Nature and nurture should be balanced. Student life is a time to realize and prepare for the competitive life ahead. It is up to the student to make use of resources available and hone his or her skills”. “Education, culture and Economic empowerment must be the primary goal of an institution of learning. ‘Grow’ and ‘Occupy’ are the two primary goals of education. Freedom must go hand in hand with accountability. Only education has the power to transform a country. Whereas, cultural programme teaches students to be organised” Prof. Mohanty added in his speech. In his address he informed the auspicious gathering about the development and achievement of the University. Water and electricity connectivity in the campus, approach road, internal road network, health care centres and University ambulance, high-tech computer centre, commissioning of Boys’ and Girls’ hotels in the campus and massive plantation for green campus were the milestone towards the development, he highlighted. He also cited about the successful entrance examination conducted by the University in 17 centres across the state and outside the state. Very soon for the first time the in the history of the University NAAC team will visit. He congratulates the students, faculty and staff of the University for organising a successful cultural day programme. Prof. Mohanty distributed certificates and prizes to all the winners of the competition organised on this occasion. Prof. Raut in his welcome address gave a warm welcome to the audience and advised the students to develop their talents along with education. Dr. Sarat Kumar Palita delivered the vote of thanks and hailed to the development and achievement made by the University. Students of the University performed classical dance, songs and drama on this occasion. The cultural programme was organised by Mr. Saurabh Gupta, Assistant Professor, Department of Journalism and Mass Communication and compeered by Sh. Sujit Kumar Mohanty, Lecturer, Department of Journalism and Mass Communication. Dignitaries, guests, Students, faculty and staff were present at large.